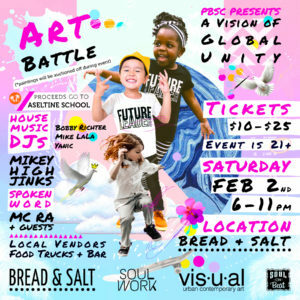 Join us February 2nd from 6-11 PM for A Vision of Global Unity, an uplifting fundraising event supporting the arts program for local at-risk youth in San Diego. Sales will benefit Aseltine School, a school of underprivileged and at-risk youth, located in central San Diego. Five locally recognized artists engage in an “art battle,” each creating their own unique 6×4 art piece, all with an end goal of raising awareness, generating unity, and giving rise to a change for a better tomorrow. The event is being held at Bread & Salt, and it is a 21+up event. 1955 Julian Ave, San Diego, CA 92113.